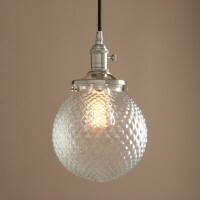 What you are looking at are clear globe glass shade vintage factory style indoor ceiling light. Shade : 20CM (7.9") Diam * 25CM (9.8") H approx. Ceiling Canopy : 10 CM Diam approx.